The New Orleans Jazz Orchestra, or NOJO, is a 16-piece big band that plays an incredibly broad and soulful range of jazz styles, all the way from the earliest sounds of the traditional second line funeral marches to the caterwauling pedal point of Charles Mingus and Duke Ellington. 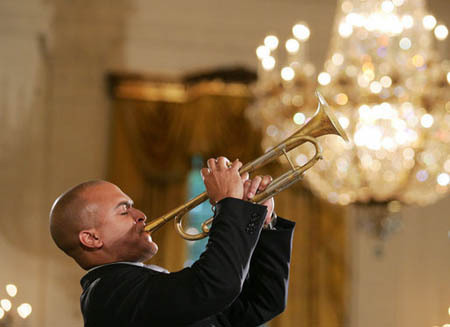 The leader of NOJO is Irvin Mayfield, a young trumpeter with a big, brawny tone and a knack for creating memorable compositions. Brought up by a jazz-loving father whom he lost recently to drowning in Hurricane Katrina, Mayfield is also the protege of jazz spokesman number one, Wynton Marsalis. At 30, Mayfield already has 10 recordings to his credit and a whole lot more music ahead of him. I spoke to him by phone last week while he was in his hometown of New Orleans. NOJO embraces a lot of different styles. What is it about the tradition in New Orleans that allows you to be so free in your choices? One thing about growing up in New Orleans: It’s diverse. It’s the only place I know where all people have access to every kind of musical tradition. For instance, you could go to the toughest, most dangerous high school in New Orleans, a place where the real hard kids are, and just bring a tuba, a trombone, and a clarinet, and if you could really play, that would probably cause a riot-but a good kind of riot, because they would be so into the music. Tuba, trombone, clarinet-aren’t those the Dixieland instruments? Yes, but don’t ever let anyone from New Orleans hear you say “Dixieland.” We don’t call it that. When I hear about “Dixieland,” I picture some old grandpas who are out of shape and they just sit there-or else maybe the band in the Chips Ahoy commercial. What are you aiming for in your concerts today? I want people to have a direct and immediate response to our music. The other night I heard someone after the show, and they said, “If that’s jazz, then I like it.” It made me happy to hear that, because then you know you succeeded, when they don’t care what it is, they just like it. It’s a hard thing, but still, I always say this: “Bad jazz is not necessarily better than something else that’s good.” There’s a paradox to jazz that comes from the blues, which is that it’s a sad feeling, but one that’s full of optimism, that American optimism that makes us feel like we can be better; that no matter how bad things get, they can still get better. Is that the New Orleans worldview-the optimism of the blues? Absolutely. You can see it in everything we do. It’s even in the way we hold the trumpet. Everybody from New Orleans-Louis Armstrong, Terence Blanchard, Wynton, me-we all hold the horn kind of high, like we don’t want it to get hit by somebody, but also so that we project, because we want to be heard rejoicing. I know you lost your dad, Irvin Mayfield Sr., to Hurricane Katrina, and I want to say how sorry I am about that. Where are you at with the aftermath of the tragedy now? There’s not a guy in my band who didn’t lose a home, or a loved one, and their whole sense of well-being from the hurricane and the floods. We were playing this old hymn, “Just a Closer Walk With Thee,” as a farewell to my dad, but when we finally got to play it at the White House for President Bush a few months ago, I decided after that it was time to retire it, to put it away. So now we are playing another piece, something I wrote, that sounds similar and serves a similar function in our set. It’s called “May Their Souls Rest in Peace,” and you will hear it close to the end of our concert in Santa Barbara because we play that every night. Do you have any parting thoughts about the upcoming show? People are always asking me, what can we do to help New Orleans rebuild? And I am never going to say no to a check, so you can write a check to one of our organizations and that would be great, but what I mean to say is this. Coming to our show is helping New Orleans, because it shows us and our culture respect and love, and that’s what we need to rebuild, just to have people show up. It’s the good will that we need. With that, we can make it. Thanks so much, see you in Santa Barbara. Thank you, come on out and we will have a good time.